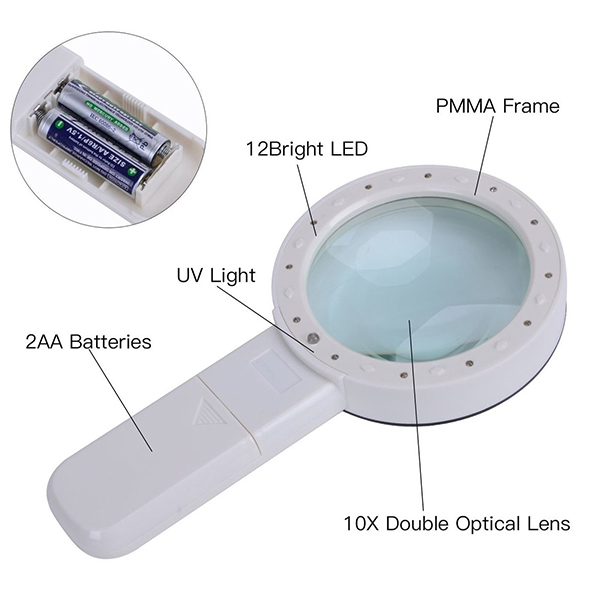 30X LED lighted handheld magnifier extra large lens is made with scratch resistant, shatterproof clear optical grade lenses designed for seniors, students, professionals, people with low vision and macular degeneration. Equipped with 12 energy-efficient LED lights built in the handle. The lights provide an evenly lit viewing area, perfect for nighttime book reading and use in low light applications. The lights run on 2 AA batteries, which can last for weeks. * Optical Quality: Clear magnifying lens with comfortable ergonomic handle suitable for seniors, people with low vision, and Macular Degeneration. * Bright LED and UV Light: You can see objects clearly in dark or insufficient light conditions with this dual LED light source. The UV light works as a counterfeit detector for things such as the paper currency, passports, Credit cards, and traveler's checks etc. * Great Elderly Gift:clear magnifying lens great for seniors, excellent for small print on coupons, prescription and leisurely reading. * Compact and stylish design, portable weight with gift box.